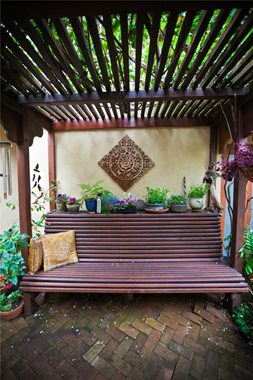 Spend an hour here to rest and renew within a space designed for one. The dense background of shrubs and trees provides a sense of seclusion with depth of foliage that screens without feeling cramped. The aromatic foliage of dwarf cypress and lavender are aroma therapeutic as are the jessamine flowers with their wild scent. Such a small space is perfect for this kind of get-away, where the design details all come together for a comfortable and beautiful contemplative experience. An ethereal stone spiral and a window cut into a fortress wall add a spiritual touch to a garden designed for a couple who wanted to be able to spend a greater amount of time outdoors. The wall acts as a display for artwork and artifacts and the picture window, which can be opened or closed reveals the abundance of herons, egrets and waterfowl who inhabit the slough that runs through the adjoining property as well as a herd of Jersey cows and stellar views of the East Bay hills and sunsets. Custom cast chairs and tables surround a fire pit and a table was cast for use as a buffet and bar. This small enclosed space with its Far East feel and wall hung mandala is designed for meditation. The wood bench is comfortable to sit on, its material rarely too hot or cold in any weather. The space is roomy enough to avoid feeling cramped, and the bench is well adapted for lying down, a pillow beneath the head. This private oasis with its finely crafted overhead shade structure is accented with hanging baskets, potted plants and wind chimes. Privacy and beauty at every turn and the scent of earth from the old brick paving bring the senses into the meditative practice of your choice. A narrow sideyard is the spatial solution for a condo, duplex or slim city lots. As one relaxes here, the beautiful textures of horsetail reeds contrasts with the slate black paving tiles and mossy green curb wall. As well appointed as an interior room, the furniture is built for comfort. This is essential for anyone ill or recovering from surgery. 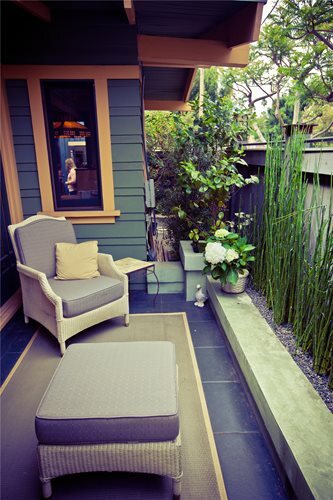 No matter how small your homesite, there's always room for meditation spaces. The sound of falling water is an ancient way of focusing the mind in order to let go of stress and problems that plague everyday life. In this meditative path, the sound of water becomes a vital aid in learning this relaxation skill and helps the mind become so tuned in that distractions are less likely to interfere with our concentration. The natural trickle of the water flow is far more appealing than heavy falls that tend to mask birds and other natural sounds that users find appealing. Gazing upon the rills of water and the small pool provide visual inspiration and a fluid coolness all summer long. 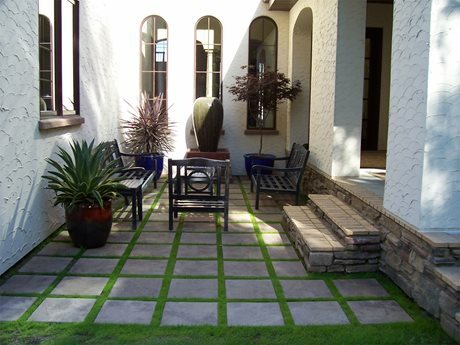 A courtyard is among the best places for meditation because it is already separated from the outside world. Here the courtyard features containers planted with tropical plants. 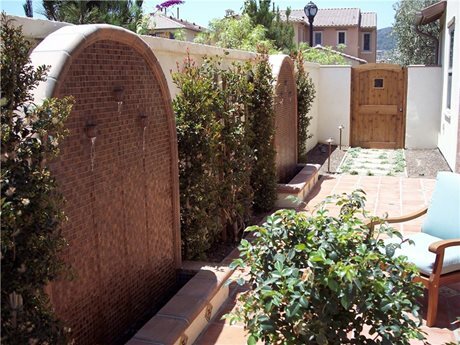 Against the wall is a water feature that provides just the right amount of sound for relaxation. Furniture provides a place to sit alone or with others. 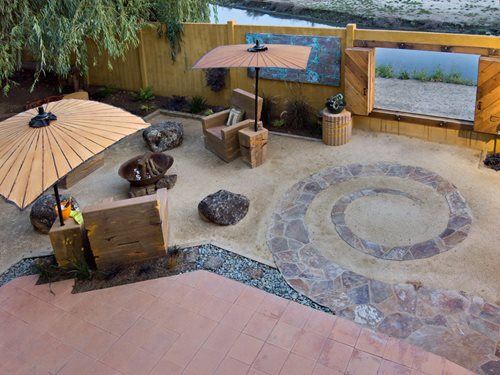 In the foggy coastal environment, sunshine is a precious commodity for outdoor spaces. Nothing warms the bones during relaxing meditation like the natural warmth of the sun. 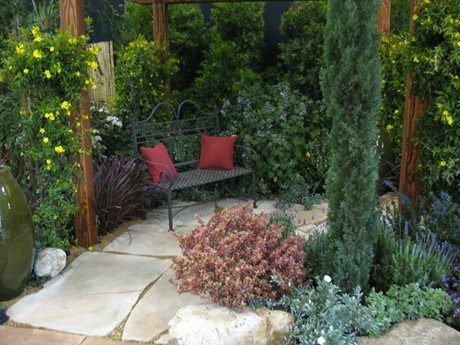 This sideyard is created with a hedge of evergreen shrubs that will soon rise above the wall to provide privacy to this small, perfectly sized meditative space. 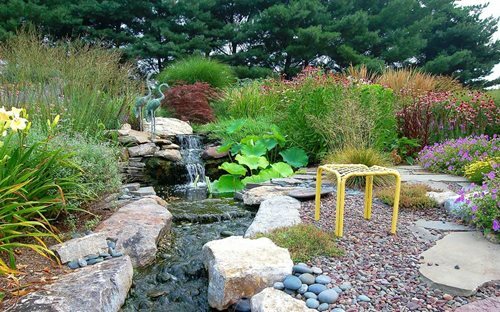 The flat wall fountains with their minimal streams defy persistent coastal breezes, preventing drift that can stain paving and leave mineral deposits on plants. Movable furniture provides a comfortable meditation site that adapts to any position for maximizing comfort in every season.